The Blood, heart, lymph, blood vessels and lymphatic vessels together form a Circulatory System. The name is Circulatory System which is also known as Cardiovascular System, is an autonomous system that allows blood circulation and transportation of nutrients, O2, CO2 and hormones to and from the cells in the body to provide nourishment and help in fighting Multiple Diseases. Red Blood Cells also known as Erythrocytes are Biconcave in shape. They contain blood pigment hemoglobin which helps in transport of oxygen and carbon-dioxide throughout the body. RBCs are without nucleus. The life span of RBCs is 120 days. 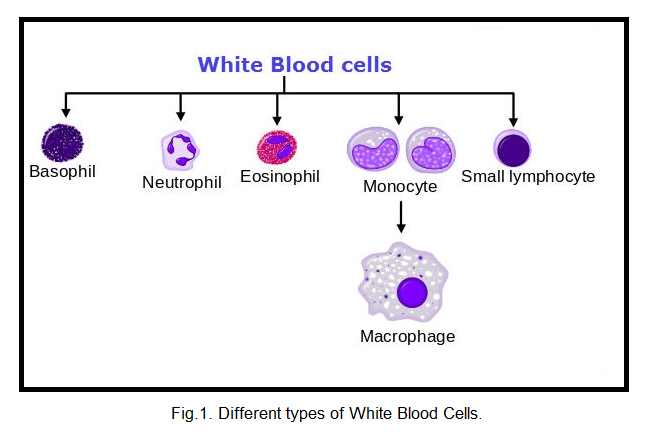 White Blood Cells also known as Leucocytes are Nucleated Cells (with nucleus). They have a very short life span of 3 to 4 days. They are Lmmune System Cells which helps in fighting foreign substances which enter our body. They are of two types: Granulocytes and Agranulocytes. 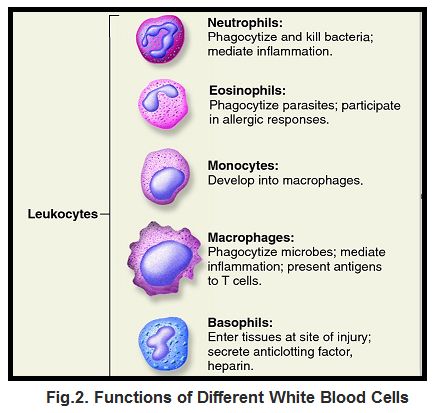 Neutrophils, Eosinophils and Basophils are granulocytes whereas monocytes and macrophages are agranulocytes. Blood Platelets or thrombocytes are cells that helps in blood clotting. The blood circulatory system is of two types- Open Circulatory System and Closed Circulatory System. Open Circulatory System does not contain blood vessels rather blood flows in body cavities. This type of circulatory system exists in Molluscs, Insects, Prawns etc. The fluid that circulates in these organisms is known as Hemolymph. 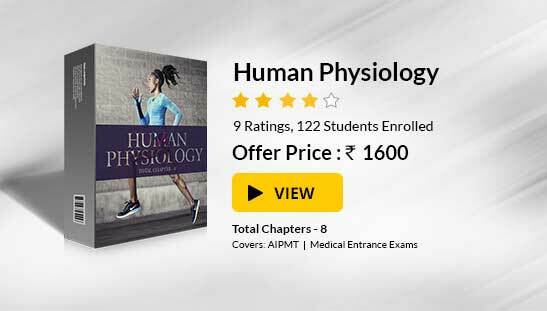 Closed Circulatory System is a characteristics of higher organisms including humans. They comprise of different types of blood vessels in which blood flow. Arteries are thick, muscular and elastic in nature. They carry blood from the heart to different parts of the body. They always carry oxygen rich blood (Oxygenated Blood) except the pulmonary artery (Associated with Lungs) that carries oxygen poor blood (De-oxygenated Blood). Veins are non-elastic and thin as compared to arteries. They carry blood from different parts of the body to the heart. They always carry Deoxygenated Blood except the Pulmonary Vein which carry Oxygenated Blood. Blood Capillaries are thin blood vessels that helps in exchange of Nutrients, Gases, Metabolites at tissue level. The main organs that pumps the blood throughout is Heart. It is a muscular organ located in middle part of the chest. The Heart muscles are known as Cardiac Muscles. They help in the contraction and relaxation of the Heart. The Heart comprises of 4 chambers - Two Auricles/Atrium and Two Ventricles. The right atria and right ventricles is associated with deoxygenated blood whereas left atria and left ventricle is associated with oxygenated blood. The right atria receive blood from two veins-superior vena cava and inferior vena cava. The left atria receive oxygenated blood from the Lungs via Pulmonary Veins. There are 4 valves present in the heart. 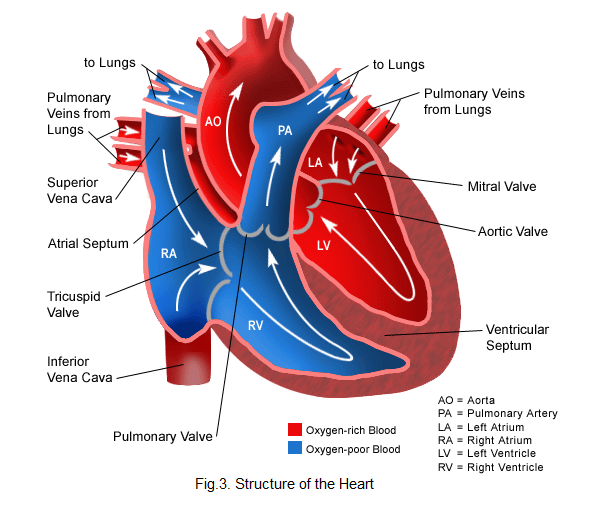 The valve present between the Atria and Ventricles is known as Atrioventricular Valves. The valve present between right atria and right ventricles is known as Tricuspid Valve. The valve present between the left atria and left ventricle is known as Mitral Valve. The mitral valve is also known as Bicuspid Valve. The valve present between the left ventricle and the aorta is known as Aortic Valve. The cartilaginous connection which extends from the wall of the heart in known as Chordae Tendinae. The muscles of the heart are known as cardiac muscles. These muscles along with chordae tendinae and papillary muscles help in rhythmic contraction and relaxation of heart. Note: For detail knowledge of cardiac muscles, kindly refer to the content “Locomotion and movement in animals”. The Heart is made up of 3 layers- Outermost Epicardium, Middle Myocardium and Innermost Endocardium. The middle myocardium layer is made up of Cardiac Muscles. The right atrium receives deoxygenated blood and passes it to right ventricle. The right ventricles then pass this blood to lungs for purification. The oxygen rich blood then reaches to left atria from the lungs. Then left atria then pumps this blood to left ventricle. The left ventricle pumps the oxygenated blood to different parts of the body. As blood passes from the heart two times, this type of circulation is known as Double Circulation. When blood passes through the heart once, it is known as single circulation. For Example: in fishes. Lymph is a whitish fluid that circulates in a lymphatic system. Lymph returns proteins and excess interstitial fluid to the bloodstream. Electrocardiogram also known as ECG records the electrical activity of the heart over a period of time. It is performed to test the condition of the heart such as heart block, myocardial infarction etc. Sinoatrial node is known as the natural pacemaker of the heart. It maintains the rhythm of the heart. It is located in the upper wall of the right atrium. Artificial pacemaker is a small device placed in the chest or the abdomen of the patients suffering from rhythmic problems. Myocardial infarction also known as Heart Attack occurs when there is a damage in the cardiac muscles (muscles of the heart). Atherosclerosis is a disease of blockage in arteries of the heart due to Plaque Deposition. Ischemic heart disease is a disease of narrowing the arteries of the heart.